If you find yourself wishing you had a smaller, easier-to-turn gear to take the pain out of riding uphill, there are several ways you can alter your bike to make things simpler. Follow our advice and you'll soon be spinning up the climbs, and you might even learn to love them! For this article we’re assuming that you have a bike with derailleur gears rather than hub gears. If you have a typical derailleur setup on a bike designed for the road, the chances are that you have two (possibly one or three) chainrings on the chainset (at the front), and somewhere between eight and eleven sprockets on the rear wheel, in what's usually called a cassette or cluster. The size of the gear is determined by the chainring and sprocket combination that you use. Running the chain on the larger chainring gives you a larger (harder) gear that moves you further forward with every pedal revolution, as does running the chain on a smaller sprocket. But what if you’re running the chain on the smaller chainring and the largest sprocket and the gear is still too hard? You can work on your fitness, of course, but you can also make changes to your equipment. Cassettes come with various different combinations of sprockets. We’ll take Shimano’s 105 R7000 groupset as an example. Shimano offers a 105 cassette with an 11-tooth sprocket up to a 28-tooth sprocket – often written as 11-28T. It also offers a 12-25T cassette, a wide-range 11-32T cassette and an even wider 11-34T. All other things being equal, the 34T sprocket on the 11-34T cassette is going to give you the easiest gear. If your bike is currently fitted with an 11-28T cassette, switching to an 11-34T cassette will make climbing less of a struggle. Swapping one cassette for another is a straightforward job but you do need special tools: a cassette tool and a chain whip. If you don’t have these, you can ask a bike shop to do the job for you. An 11-34 Shimano 105 cassette currently costs £47. SRAM kicked off the use of double chainsets and super-wide-range cassettes a few years ago with its WiFLi designs, which were the first systems to combine a 50/34 crankset with an 11-32 cassette. SRAM also offers an 11-36 cassette, intended for use with single chainrings. Shimano only goes to 11-34 with its 105 components, but there are reports of people getting SRAM 11-36 cassettes to work in Shimano systems. The very latest versions of Shimano's Ultegra and 105 GS rear derailleurs will actually handle an 11-40 cassette, which opens up a range of possibilities for gravel bikes, touring bikes and any other situation where you're not in a hurry. In the last couple of years, Shimano has introduced 11-34 cassettes at Tiagra, 105 R7000, and Ultegra R8000 levels, so the old 105 5800 is now the only enthusiast-level groupset you're likely to find on a new bike that doesn't officially work with 11-34. 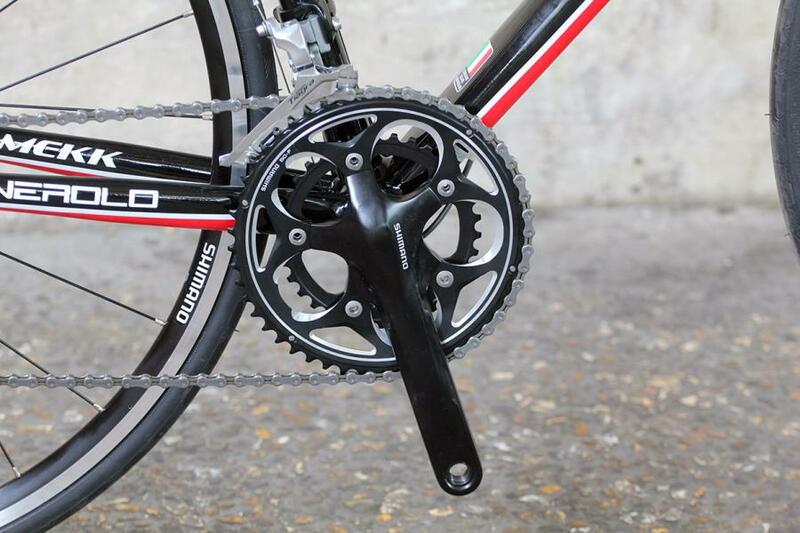 If you have a Campagnolo system, then for most groupsets you are limited to a 29-tooth sprocket. However, the Potenza groupset launched in March 2016 offers an 11-32 cassette so Italophiles can also get low gears. If you change your cassette, you need to bear in mind the maximum sprocket your rear derailleur will handle, and its total capacity. This is the total difference in chainring and sprocket sizes that it can handle. Say you have 50-tooth and 34-tooth chainrings: the difference between the large one and the small one (50 - 34) is 16 teeth. And say your bike is fitted with an 11-28T cassette: the difference between the large one and the small one (28 - 11) is 17 teeth. Add them together and you get a total difference (16 + 17) of 33 teeth. Shimano’s short cage 105 R700 rear derailleur has a maximum sprocket of 30T and a total capacity of 35 teeth. That means you can use it with the setup described above. But you can’t use that rear derailleur with the same chainset and an 11-34T cassette for two reasons. For a start, it will struggle to get on to the 34T sprocket, though it might work if your gear hanger is long enough. Even if the derailleur will shift to the big sprocket, the total difference you're asking it to handle would be 39 teeth, so either the chain would be too slack in the combination of smallest chainring and smallest sprocket or too tight in the largest. That can cause the transmission to jam or even break. If you wanted to fit an 11-34 cassette, you’d also need Shimano’s GS rear derailleur (the 105 version can be found for £36) which has a total capacity of 39T. You’d also need to fit a longer chain (the Shimano 105 one retails at £17.50). Want to go even lower? 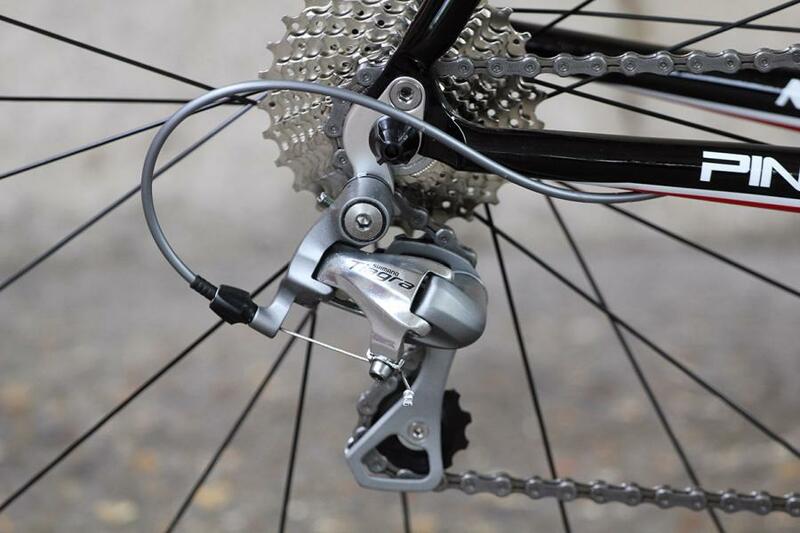 There are reports that this derailleur even works with a Shimano 11-40T cassette (£29.99). If you’re on a road bike you’ll probably have a double chainset, that is, a chainset with two chainrings. There are three common double chainring combinations: a 52 or 53-tooth outer chainring with a 39-tooth inner chainring; a 50/34T pairing, known as a compact or a semi-compact 52/36T. If you have a 53/39T setup, for example, and you find the gearing too hard, you can buy a 50/34T chainset or fit smaller chainrings to your existing cranks (check that the new chainrings have the same bolt circle diameter, BCD, as the old ones). You’ll also have to alter the position of your front mech and get yourself a new chain (or at least shorten your existing chain). Like rear derailleurs, front derailleurs have a maximum capacity. Here it relates to the difference in size between the large chainring and the small chainring. So, say you are using 50/34T chainrings: the difference is 16 teeth. The capacity of a Shimano 105 front derailleur, for example, is 16T so it’ll cover all of the common double chainset combinations. If a compact chainset isn't small enough, you can go lower still with a sub-compact like the FSA Energy. These typically have 44T and 30T chainrings for a roughly 10 percent drop in gears. One final option for changing your gearing is to swap from a double chainset to a triple chainset. A typical triple setup for the road has a 30T inner chainring compared with the 34T inner chainring of a compact setup. However, this is quite a complicated swap. You'd need to change your shifters, your chainset and probably your derailleurs too. You’re far better off buying a bike that’s already set up with a triple rather than swapping to it. Over the past few years, the introduction of cassettes and rear mechs that provide a super-wide range of gears has meant that triple chainsets have largely fallen out of favour for road use. That said, some people get on well with triples; it comes down to personal taste. Good luck out there on the climbs! In the last couple of years, Shimano has introduced 11-34 cassettes at Tiagra, Ultegra R8000 and Dura-Ace levels, so our 105 example is now the only enthusiast-level groupset that doesn't officially work with 11-34. However, all Shimano 11-speed road components are interchangeable, so you could get lower gears by fitting an Ultegra 11-34 cassette which will cost you £64.99 or thereabouts(link is external). You'll need a new rear derailleur too; more about that in a moment. Shimano have already announced the 105-level HG-700 11-34 road/MTB cassette, the cheaper brother of the Ultegra-level HG-800 11-34 - that's due to be available in a couple of months. Also, if you have a 105/Ultegra GS rear derailleur you most certainly won't need a new Ultegra 8000 mech, not sure where that came from. Surely this article needs updating to include super-compact chainsets. These have been available for a while via Sugino and Middleburn, but now that Easton are getting involved too surely you need to add in something about them. This article would be better for the inclusion of a few lines about gear ratios. It's not really worth considering changing your gearing until you understand what it is you want to achieve. A lower gear by changing the cassette or chainset/chainrings might come at the expense of bigger gaps between gears or a lot of repeated gears, or lots of cross-chaining to achieve the right ratios. Put the ratios you already have into this and see what changing the cassette or chanrings would do for your set up. I'd also mention that there are sub-compact set ups that use mountain bike sized chainrings and touring chainsets (some very high end, like the TA Carmina and Middleburn X-type) and even Shimano's mountain bike chainsets. At the budget end, the Stronglight Impact chainsets offer doubles and triples with very useful combinations of chainrings. It's also worth mentioning the dedicated cyclo-cross chainsets which have reduced chainring sizes (Shimano's FC-CX50 offers 46, 36 chainrings). Although the article follows established dogma, it is simply untrue that a short cage Shimano rear derailleur cannot run a 50/34 and 11-32 combo - I have done so successfully for over a year with no problems. Lots of articles and videos out there on the topic. All depends on your bike geometry at the back and a bit of chain length/b screw adjustment. Rear mech is very close on small-small combo but there is just enough clearance and of course no one uses that anyway, right? I wouldn't like to try a 34 though. ..and the Shimano Ultegra 6800/8000 and RS-5xx series cranks, FSA and the increasing availability of direct mount cranksets which should make things much easier to play around with. Most buyers seem to "choose" based on what the adverts tell them - usually something with redundant 11 & 12 sprockets not to mention the 53/39 chainset, which items are only suitable for 1st Cats and other supermen or women. Shimano et al will tell us that "the market wants" these things but in fact they created this market with their adverts, generally referencing technology from professional racing. What if you could only buy Ferrari and Maserati geat boxes for your Seat Ibiza, eh!? At least the rascals have (slowly) recognised that ordinary mortals will benefit from large sprockets of 32 or more teeth. Why, though, do they keep on with these 11 and 12 sprockets? If you can pedal in 53X11 (or even 50X11) at a reasonable cadence (say 90rpm) you can surely pedal up Fleet Moss in 34X27...... If you can't, a 50X14 is top gear enough. Yes, yes, Mr MAMIL ... you can't do without 53X11. But stop your pedalling downhill and get in an aero tuck, as you'll go faster. I have a 14-32 11-speed cassette on my winter bike. (11 speed was unavoidable at the time I decided to have hydraulic brakes with STI lever). Shimano make an Ultegra 11-32 and a 14-28. I had to buy both to make a 14-32, leaving a "spare" cassette of 11-28 with some queer tooth jumps between the remaining sprockets. That's just annoying. And expensive. I also have to make do with a 10-speed triple chainset as there are no 11-speed triples now. Happily it works fine with an 11-speed chain. PS MTB triple chainsets have the wrong chainline (typically 50mm) for a road bike (typically needing 43.5mm). woah, woah, woah, Cugel. You're speaking common sense. Nobody's going to get that. I've never understood the 11t cog except for pros racing decents. That Sheldon Brown link is a load of crap, anyone who puts crank length into a gear calculator clearly doesnt understand gear ratios. A gear ratio, however you represent it (in inches as us Brits like to use or any other figure) is purely the ratio of the chainring to the sprocket size. If your chainring is 4 times the size of the sprocket then for every turn of the pedals your wheel will go around 4 turns regardless of the length of the crank used to turn it around. Simple, no further factors to consider. 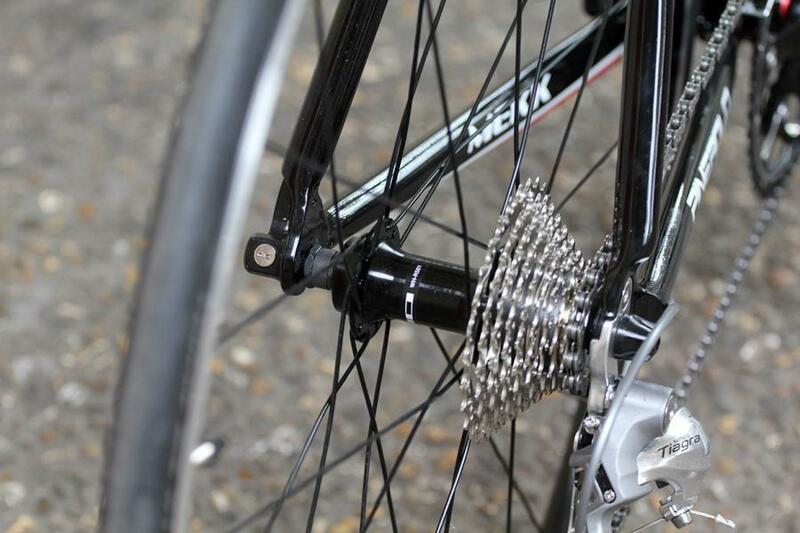 1) on his gear calculator page you will find drop down menus that allow you to change crank lengths (if you're wanting to calculate 'gain') and the gear units, for instance, gear inches, metres development, or speed in mph or kmh at various pedal rpm. 2) there is a useful calculator that gives you a good visual representation of gear sequences and allows you to compare two systems at a time at www.gear-calculator.com. It includes many common chainring and cassette combinations and allows you to adjust factors such as tyre size and width and pedal rpm. Like Sheldon Brown's site, it also lets you calculate gear ratios from many internal hubs. It has had many iterations and is regularly updated and improved by its author. 3) we need to be clear what we mean when we write 'gears': do we mean cog and chainring teeth (11-12-13 &c and 52-39 &c)? Cog & chainring combinations (52x13)? 11sp vs 10sp? Gear sequence (1st to 22nd)? Gear relationship (higher/lower; highest/lowest)? Cog number on cassette (1-11)? Gear ratios (1:1, 2.74:1)? Gear inches (30–135")? Metres development (4.56)? 'Gain'? Speed at rpm? Or the whole system (derailleurs, chain, cassette, [internal hub] chainrings)? The crank is a lever, and as with all levers, the longer the lever from effort (your foot) to load (the bb axle), the less effort you need per unit of movement achieved. I agree on the lever front in general, but it's less straightforward in cycling, as the longer the lever, or crankarm, the higher your knee comes up, which makes it harder at the top of the power phase to push down. Like a deep versus less-deep squat, sort of! Yes, clearly the crank length needs to be determined in proportion to your leg length. It's not something you should be playing around with (too much) in an effort to change your gears, but it is a component of the whole system. My goto Ti Tripster ATR has a gear range of 17"-115" using triple Di2 setup . So what levers are you guys using on a road bike to operate a triple derailleur? Domane1 in para 3) managed to make something simple look very complicated. Not really necessary in my view. Oval chainrings might also give a boost to efficiency, could help you avoid having to change for slightly lower gears, or if you've got no real options for lower gears? About £35 for inner chainring, AbsoluteBLACK from ProBikeKit. It's about as cheap as buying a lower-range cassette. After years of sticking with triples I'm now just about to try oval super-compact. AbsoluteBlack's 46/30 set of oval rings to fit on the R7000/R8000 style cranks. With rings that small, the full range of an 11-34 cassette makes sense (I think). Fitted it last weekend, can't wait to try it out. i ask myslef, for which alien do they built this combination 50 x 11-13? who needs that?